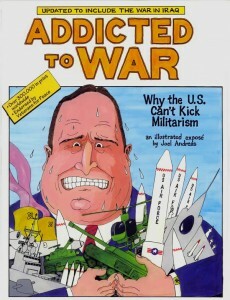 Addicted to War: Why the US Can’t Kick Militarism, is available now in its entirety online, is a history and criticism of US militarism and military policy. Apparently this is being used in some schools as a history textbook, and I can attest (from what I’ve read–so far just the first 10 pages out of 77) that this includes a ton of interesting quotes, citations, and even some photographs, in amongst the illustrations. I used to have a copy of The Cartoon Guide to Physics laying about somewhere, and I guess I’m reminded of that because this is also non-fiction and written in a similar matter-of-fact style. It looks like author/illustrator Joel Andreas has only really ever written political comics. I think it might be interesting to write a “long-form comic books and politics” blog post sometime, but I am not particularly qualified. Having the book online is really just a self-professed ploy to get you to purchase a physical copy, so if you really like it, go ahead and buy a copy or fifty. (They sell boxes of 56 for $175.) I found out about it from True Majority, where you can buy a single copy for $8. This entry was posted by Martin	on Thursday, August 21st, 2008 at 3:23 pm and is filed under independent, TPBs/graphic novels, webcomics. You can follow any responses to this entry through the RSS 2.0 feed. You can leave a response, or trackback from your own site.